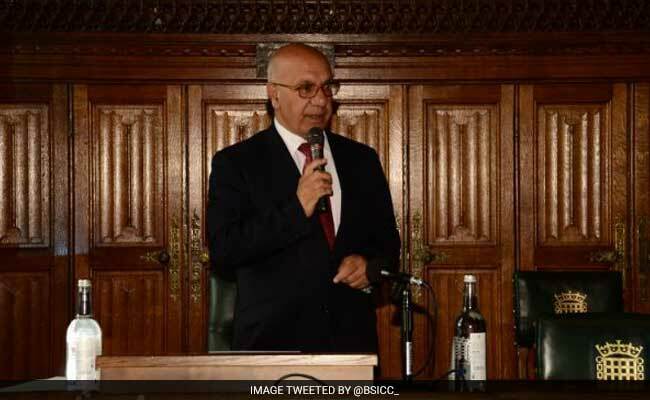 One of Britain's longest serving Indian-origin MPs, Virendra Sharma, was caught on camera at a multi-faith meeting in London saying that "Pakistan is not harbouring terrorist groups or sponsoring terrorism". Virendra Sharma won by a big margin over his Conservative party rival in the 2015 general election. London: Indo-Pak tensions over the issue of cross-border terrorism have made their way into the UK general election campaign that has been hotting up. The Labour MP for Ealing Southall, a heavily Indian- origin constituency, and chair of the Indo-British All Party Parliamentary Group (APPG) instantly faced questions around this statement during the weekend. "Given your seniority as a long-standing British Indian- origin member of Parliament and that you hold various posts ostensibly promoting UK-India relations, your comments are totally at odds with everything we have tirelessly worked on over many years. Why," questioned Manoj Ladwa, a senior Labour party member and political communications strategist, in a letter to the MP. "I would strongly urge you to make an urgent public and written statement clarifying your position and that of the Labour party before this issue spirals any further," said Mr Ladwa, CEO of the UK-based media house India Inc.
Mr Sharma attempted to explain the heated argument that was caught on a smartphone camera and found its way on to social media. "During elections strong feelings are common, but this is no time for people to raise issues for their own selfish reasons," he said in a statement today. "It is important that we consider our community and put its needs above our own. I am proud to represent a diverse community made up of all religions and nationalities and I think it is important that politicians represent everyone, not just a narrow section," he said. Mr Sharma, who won by a big margin over his Conservative party rival in the 2015 general election, is seeking his fourth re-election in the June 8 snap poll. "I am proud to represent the area I have lived in for the last 49 years and my campaign will focus on our community and how much we can achieve. This election must be about bringing people together, improving people's lives and turning our backs on the politics of division," said the 69-year-old Punjab-born MP. The campaign for next month's election is heating up on all sides, with the ruling Conservative party losing some of its massive lead in opinion polls. The Tory lead in terms of vote share has halved compared to a week ago, according to a latest Survation poll, with British Prime Minister Theresa May's party on 43 per cent compared to Labour's 34 per cent. A YouGov poll over the weekend also appeared to show Labour narrowing the gap at 35 per cent compared with the Tories on 44 per cent. The manifesto launches by the two main parties last week are believed to be behind the swing, with Conservative party plans on social care for the elderly coming under scrutiny. "My manifesto is honest and upfront about our challenges. It includes plans to strengthen the social care system with more and sustainable funding to cope with the long-term pressures caused by the fact that we are an ageing society," said May in a speech in Wales today. The Labour party, on the other hand, made a direct play for the youth vote, with an announcement to bring forward its pledge to scrap tuition fees to include students starting university this year if it wins the election. The anti-Brexit Liberal Democrat party focused on the ruling party's plans to double the migrant surcharge on companies employing migrants from outside the European Union (EU), including India. The party's shadow chancellor, Vince Cable, said, "The Brexiteers, many members of whom are now in the Cabinet, told us that leaving the EU would mean we could be more generous to our Commonwealth partners, it is now clear that this was another leave lie. "The consequences of this policy to businesses, including the multi-billion-pound restaurant industry, who were already struggling to make ends meet due to strict regulation and charges is another example of why the Conservatives have buried any claim to be the party of business."